Dr Chan has a PhD in Genomics and Computational Biology from UQ. Upon graduation, he underwent postdoctoral training with Professor Debashish Bhattacharya at Rutgers University (New Brunswick, New Jersey), focusing on algal genomics and evolution (phylogenomics), and the origin of plastids. His research routinely involves de novo assembly and analysis of high-throughput sequencing data. 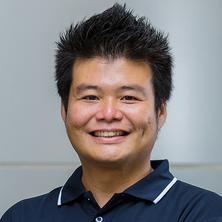 Since his return to UQ in November 2011, Chan has been using advanced computational and database approaches to explore and develop highly scalable phylogenomic approaches, and to study genome evolution of microbes, including bacteria, algae and protists. Chan is also an Affiliate Lecturer at UQ's School of Chemistry and Molecular Biosciences. Reef-building corals are critically sustained by the symbiosis between the coral animal and the symbiotic dinoflagellate algae. Breakdown of this symbiosis leads to coral bleaching, and if not soon re-established, coral death. The coral symbionts (in family Symbiodiniaceae) and their close relatives (i.e. the other dinoflagellates) are highly diverse, and are key primary producers in the oceans. Working with our collaborators nationally and internationally, including within the Reef Future Genomics (ReFuGe) 2020 Consortium, we are generating de novo core genome data from coral symbionts and their relatives, including symbionts isolated from the Great Barrier Reef. We are interested in genome evolution of these ecologically important species, specifically related to their evolutionary transition from free-living to symbiotic lifestyles, and its functional implications on the coral holobiont and the health of the coral reefs (e.g. via hologenomics approach). We are interested in the evolution of genomes in response to the organism's adaptation to changing environments. Using comparative genomics, we aim to identify genome features, gene content, functions, and/or pathways that are specific to distinct ecological niches. Some of the questions we are interested in include genome features unique to the coral symbionts, stress tolerance, and antibiotic resistance in bacteria. Through UQ Genomics Initiative and UQ Genome Innovation Hub, we adopt cutting-edge genomic technologies to generate high-quality genome-scale data for addressing these questions. Working with our collaborators, we adopt an experimental approach to assess microbial genome evolution in real-time, i.e. decoding the genomes across multiple generations of the microbes grown under a controlled, stress condition. Highly scalable phylogenomic approaches are needed to make evolutionary sense of the ongoing deluge of sequence data. The current standard phylogenetic/phylogenomic approach using multiple sequence alignment is based on the implicit assumption that all homologous sequences are contiguous, and can be computational expensive. We are exploring the use of alignment-free methods (specifically the use of k-mers) in large-scale phylogenomic analysis, and their sensitivity to key aspects in molecular evolution. We are expanding this approach to infer phylogenomic relationships beyond the conventional tree-like structure (i.e. as networks). Chan has published over 50 scholarly publications in the areas of microbial genomics, evolutionary biology, and bioinformatics. His research work since 2003 has been continuously challenging the working hypotheses in evolutionary biology. His PhD thesis work overthrew the plausible but incorrect assumption that whole genes are the units of lateral transfer, and revealed a bigger footprint of genetic transfer in the evolution of bacterial genomes. His research of algal genomics demonstrates a single origin of primary plastids, and the remarkably complicated evolutionary histories of algae due to genetic transfer and endosymbiosis. This body of work establishes a single origin of Plantae, the foundational lineage that gave rise to all plants and algae. His current research on the coral reef symbionts aims to elucidate the roles that algae play in the adaptability of coral reefs. His recent research on scalable phylogenomics demonstrates the use of alignment-free methods to accurately and quickly infer phylogenomic relationships from thousands of microbial genomes. Chan, C. X. (2013) Phylogenomics of marine algae. Malaysian Journal of Science, 32 11-18. Chan, Cheong Xin and Bhattacharya, Debashish (2010) The origin of plastids. Nature Education, 3 9: 84-1-84-5. Phang, Siew-Moi, Wong, Ching-Lee, Lim, Phaik-Eem, Yeong, Hui-Yin and Chan, Cheong Xin (2005) Seaweed diversity of Langkawi with emphasis on Northeast Langkawi. Malaysian Journal of Science, 24 77-94. Chan, Cheong Xin (2004) Comparing Different Approaches in Large-Scale Seaweed Gene Discovery. Bioinformatics India, 2 3: 106-111. Moustafa, Ahmed, Chan, Cheong Xin, Danforth, Megan, Zear, David, Ahmed, Hiba, Jadhav, Nagnath, Savage, Trevor and Bhattacharya, Debashish (2008). A phylogenomic approach for studying plastid endosymbiosis. In: Jonathan Arthur and See-Kiong Ng, Genome Informatics 2008: Proceedings of the 19th International Conference. 19th International Conference on Genome Informatics (GIW 2008), Gold Coast , Qld., Australia, (165-176). 1 - 3 December 2008. Chan, Cheong Xin, Beiko, Robert G. and Ragan, Mark A. (2007). A two-phase approach for detecting recombination in nucleotide sequences. In: Proceedings of the First Southern African Bioinformatics Workshop (SABioinf 2007). The First Southern African Bioinformatics Workshop, Johannesburg, South Africa, (9-16). 28-30 January 2007. Chan, Cheong Xin, Beiko, Robert G. and Ragan, Mark A. (2004). Benchmarking the Detection and Analysis of Recombination. In: Proceedings of the 12th International Conference Intelligent Systems for Molecular Biology (ISMB) and 3rd European Conference in Computational Biology (ECCB). 12th International Conference Intelligent Systems for Molecular Biology (ISMB) and 3rd European Conference in Computational Biology (ECCB), Glasgow, UK, (160-160). 31 July - 4 August 2004. Chan, Cheong Xin, Beiko, Robert G. and Ragan, Mark A. (2004). Oh Father Where Art Thou? Comparing Different Ways of Finding Recombination Events. In: First ARC Centre in Bioinformatics Annual All Hands Meeting, The University of Queensland, (). 10-11 May, 2004. Chan, Cheong Xin, Ho, Chai-Ling, Othman, Rofina Yasmin and Phang, Siew-Moi (2002). Total RNA Extraction for the Red Seaweed Gracilaria changii (Gracilariales, Rhodophyta). In: Asia-Pacific Conference in Marine Science and Technology, Kuala Lumpur, Malaysia, (). 12-16 May, 2002. Chan, Cheong Xin (2007). Units Of Genetic Transfer In Prokaryotes PhD Thesis, Institute For Molecular Bioscience, The University of Queensland. Chan, Cheong Xin, Beiko, Robert G. and Ragan, Mark A. (2007) A two-phase strategy for detecting recombination in nucleotide sequences.